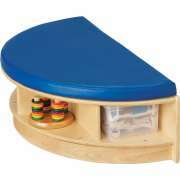 Shop Reading Centers For Preschool And Kindergarten! What special furniture do you need in a children’s library? Reading centers are great for libraries and early-childhood classrooms. They create a cozy space where little ones can read independently, enjoy books with classmates or listen to a story that their teacher is reading. 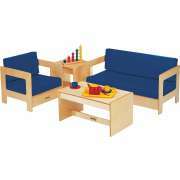 With vinyl upholstery in a selection of colors, they have a comfortable aesthetic that kids are sure to enjoy. If you are building a literacy center for the classroom, there are a number of additional pieces that can help promote early reading and writing skills. A preschool writing or listening center lets your students practice independently with all of the resources they need close at hand. How can you create a space for reading in the classroom? Whether during designated reading time or free play, it is important to provide a well-stocked reading center in your early-childhood, kindergarten or even an elementary school classroom. The first thing you need to think about besides the bookshelves is some comfy seating. Depending on the age of your students, you might choose kids couches or some cozy floor cushioning. 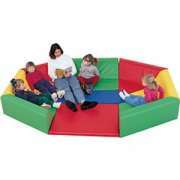 What is the most comfortable way to read to kids? Every teacher who works with young students knows how challenging it can be to find a comfortable position for reading to the class. It is even more difficult if you want to make sure that every student has a clear view of the book. When you are contemplating the right reading center furniture, reading terraces are a great option for educators who want to enjoy books in a comfortable position which allows the whole class to see clearly. The stadium-style seating enables everyone to see without the students having to crowd in or the teacher being uncomfortable. With a selection of sizes, you can enjoy this wonderful option in a variety of spaces. What kind of seating belongs in a kids library reading nook? The right reading habits should start from a young age. One of the best ways to get kids excited about books is to make sure that your library includes a kids reading center with appropriately-sized seating for all ages. 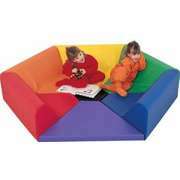 Toddlers will like colorful floor cushions with padding that allows them to sit back and relax. 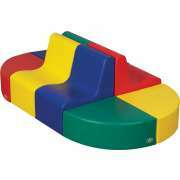 Older kids are sure to appreciate colorful kids couches and reading benches. No matter what option you choose, vinyl upholstery is ideal because accidents and spills are bound to happen and vinyl is very easy to clean. With Hertz Furniture’s selection of bright colors, you can coordinate with your library or classroom decor or use the opportunity to bring in a new complementary hue. 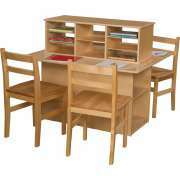 What furniture should be in a classroom reading center? Once you have the bookshelves and cozy seating taken care of, it’s time to think about what other furniture can be added to create a space that is dedicated to literacy. 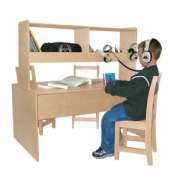 A preschool writing and listening center will complement the reading corner beautifully. You can even feature various books each week and connect them to new tasks in the adjacent centers to create a full learning unit.